Capstone Life Time Balancer is a concentrated, very low energy, balancer pellet supplement featuring premium quality ingredients scientifically formulated to meet all the protein, vitamin and mineral requirements for each stage of a horse’s life. It is suitable for all classes of horses. 25% Protein: High protein to meet the requirements of growing and breeding horses. High quality protein sources: Includes Soya Meal and Lysine for a quality amino acid profile. Fully fortified: Meets all the protein, vitamin and mineral requirements of growing, breeding and performance horses to supplement home grain mix diets. Good balance of major minerals: Magnesium, Calcium and Phosphorous in balance to build strong bones and support lactation in mares. Low calorie feed: Can be fed alone as a protein, mineral and vitamin supplement to horses that do not need energy. Concentrated feeding rate: Allows flexibility to add grains and sugar as required, and tailor the diet to meet individual needs. Pelleted formula: Cost effective processing that reduces wastage and sifting of powdered vitamins, minerals and amino acids. Growing, breeding and performance horses will require between 0.5kg to 1kg of Capstone Life Time Balancer per day. 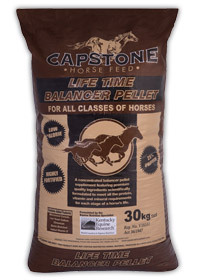 Capstone Life Time Balancer can be fed as the sole feed for horses that do not require extra energy from grain. Capstone Life Time Balancer should be fed in conjunction with a minimum of 1% of the horse’s bodyweight (5kg for a 500kg horse) of good quality roughage such as chaff or hay for optimal hindgut health. For best results, do not feed more than 2.5kg of additional grain per feed. Capstone Life Time Balancer can safely be fed to young horses that gain too much weight or suffer from Developmental Orthopaedic Disease. Capstone Life Time Balancer slows growth rates whilst providing the horse with the essential protein, vitamins and minerals. The above rates are recommended for horses that are 500kg at maturity. Adjust intake accordingly for smaller or larger horses. Canola Meal, Soya Meal, Lupins, Sunflower Meal, Lucerne, Wheaten Bran, Molasses, Salt, Feed Lime, Di Calphos, Chromium, Magnesium, Vitamin & Mineral Premix, Live Yeast, Lysine.